A DSLR full body 3D scanner relies on photogrammetry to create a 3D scan. Photogrammetry works by finding shared features between multiple photographs to calculate depth. It is predominantly used in the visual effects industry. *Note: Scroll to the end of the article for an update on the current state of DSLR photogrammety full body 3D scanners. Access full 3D scanning technology comparison here. A DSLR photogrammetry full body 3D scanner normally consists of 70 to 150 DSLR cameras (it can have many more depending on the application) and lighting equipment mounted at specific angles around the subject being 3D scanned. The cameras have a special peripheral attachment that can synchronize the captures so all cameras fire within a fraction of a second of each other. These setups rely on exceptionally high quality data and specialized camera angles so the cameras typically need to be manually moved and focused on the subject being scanned to accommodate for their body shape and pose. Following a capture, the photos are transferred to a computer where an operator will run the photos through photogrammetry software. The photogrammetry software will create a point cloud by locating features shared across many pictures and calculating their depth. The time to process a 3D model using photogrammetry software ranges from 25 minutes to multiple days depending on the speed of your computer and the desired resolution. Like all other full body 3D scanning technologies, photogrammetry struggles with scanning transparent and reflective materials. 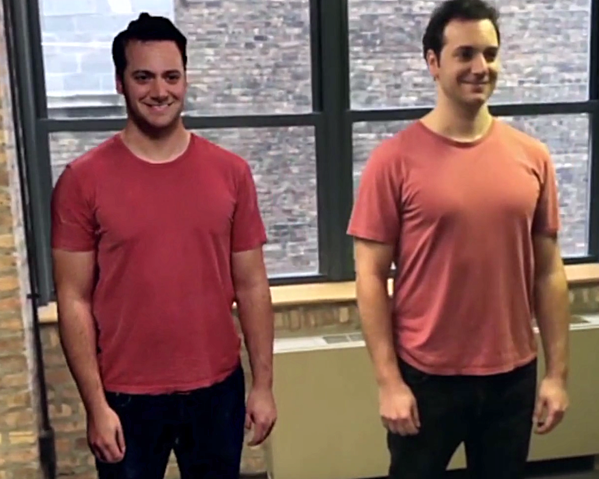 In addition, photogrammetry struggles with flat colored materials (ex: plain colored clothing) since the software relies on being able to identify matching pixels across numerous images, so if an individual is wearing a plain black t-shirt, it has a very difficult time trying to figure out which black pixel corresponds to which across images. Photogrammetry does not do as good a job at capturing fine details as other technologies, so fine details like buttons on clothing or glass frames typically do not come out. If you need to reliably calculate the geometry of person being 3D scanned (ex: medical applications), then you are likely better off going with a different technology. The largest advantage of a DSLR photogrammetry system is the 3D scanning process is instantaneous so your subject has very little opportunity to move and mess up the data. That having been said, you still want to make sure the person you are 3D scanning is completely still for the capture. In addition to the reliability increase an instantaneous capture affords, it also means you can achieve excellent texture quality as when the photos are being stitched together, they all match perfectly. With poor calibration or due to the material limitations listed above, it is sometimes difficult getting good geometry data. Post production work on a 3D scan from a DSLR photogrammetry system is typically spent fixing jagged geometry, adding geometry to parts that were not covered by enough camera views and accentuating fine geometry details like buttons on clothing. The post production time for 3D scans off of a DSLR photogrammetry system is usually a couple hours per file, and can vary depending on how much detail you want to add to the 3D scan. One thing to note, is typically when a company advertises the quality of a 3D scan off of a DSLR photogrammetry system, they advertise the file after it has been touched-up by a 3D artist. To compare systems apples to apples, be sure to ask for raw, unedited files from anyone you speak with. Quality - When calibrated correctly, DSLR full body 3D scannners can produce very high quality 3D scans, which is one of the reasons why they are used in the VFX industry. NOTE: Hybrid full body scanners are now starting to catch up. Scan time - Since photogrammetry is an instantaneous process it is very well suited for scanning things that have trouble standing still (people, pets etc.). Portability - Due to the high number of cameras, lights and networking equipment DSLR photogrammetry systems can be really heavy, tricky to assemble and awkward to move around. Processing time - Depending on the speed of the computer and the desired quality level, the time it takes to process a 3D scan is 0.5 - 24+ hours, so it is infeasible to preview a 3D model for your customer and assess the 3D model quality while the customer is still onsite. The other downside to long processing times is a processing queue can build up very quickly, significantly affecting throughput. If for example a customer wants multiple 3D scans processed before deciding which to purchase, it may be multiple days before that customer gets models to choose from. For DSLR photogrammetry systems it is a good idea to have multiple computers running to process the 3D scans to increase throughput. Cost - The cost to buy all of the DSLR cameras (~$415 /camera), lights, networking equipment and stands to mount the cameras on can easily be greater than $50,000 and typically costs well over $100,000. 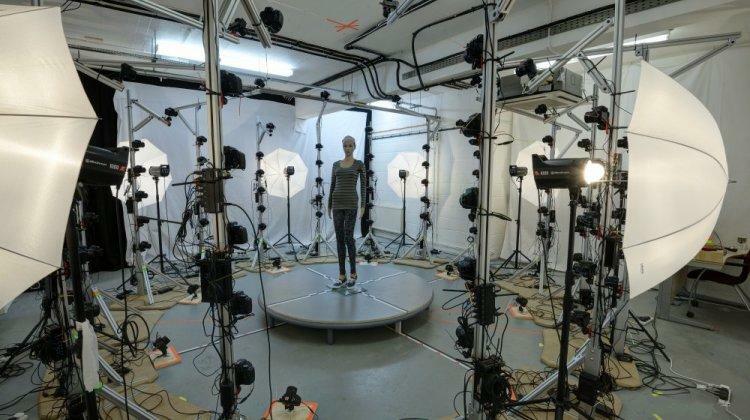 In general, this is the most expensive 3D full body 3D scanning system. Space Requirement - Photogrammetry systems require an entire room, 20’ x 20’ in dimensions. While a well calibrated DSLR photogrammetry system can produce very high quality 3D scans, because of their the high upfront cost, their space requirement and their long scan processing time, they are not well suited for the mass market. Another thing to note is the resolution of the 3D scans produced from DSLR photogrammetry systems is much higher than what current full color 3D printers on the market can produce, so much of the increased quality is immediately lost due to 3D printing limitations. DSLR photogrammetry full body 3D scanners will always exist for cases where photorealistic models are required such as in the visual effects industry. We predict they will persist and fill the niche for ultra high end 3D photography where 3D models are printed at over one foot (size at which the increased 3D model quality is apparent on a 3D print) for many hundreds if not thousands of dollars per 3D figurine. Is 3D Scanning Technology a Catalyst to Augmented Reality’s Growth? Want to see what state of the art hybrid 3D scanning is like?